Over the last year, the clearest trend in the drone industry has been a move toward units that are smaller and more portable. 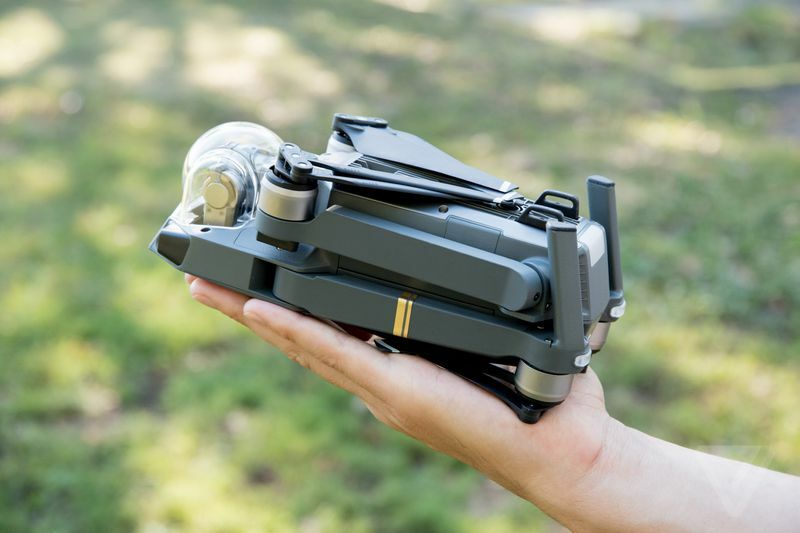 Yuneec introduced a drone with foldable arms, and last week GoPro did the same. During its presentation for the new Karma drone, GoPro repeatedly emphasized how easy the unit was to slip into a backpack and bring anywhere. The Mavic Pro, DJI’s latest offering, follows this same trend. Unveiled today, it is about half the size and weight of DJI’s flagship unit, the Phantom. But it’s much slimmer, because the props holding the rotors fold in over the body, making the whole profile small enough to fit into a backpack or even a purse. Hell I almost jammed it into the back pocket of some ordinary pants. The amazing thing about the Mavic Pro is that, while it shrinks the physical form factor of a DJI drone down significantly, it doesn’t sacrifice any of the advanced features that make the Phantom series so popular. You still get sensors on the front and bottom, providing you with obstacle avoidance, subject tracking, autonomous landing, and stability indoors without GPS. The camera uses the same sensor as the Phantom 4, shooting 4K video at 30 fps and full 1080p HD at 96 fps. It has a 12-megapixel camera with support for Adobe DNG RAW. The field of view is a little smaller, shrinking from 94 degrees down to 78. You also don’t lose much in terms of flight performance: the Mavic Pro claims to offer 27 minutes of battery life on a single charge and has a top speed of 40 miles per hour — just shy of the 45 mph you get on the much larger, more powerful Phantom 4. Incredibly, despite its smaller size, the Mavic Pro actually has a few areas where it is now more powerful and intelligent than DJI’s larger drones. DJI says it can stream live video from up to 4.3 miles away, compared with a maximum range of 3.1 miles on the Phantom 4. The new system also promises to live stream 1080p video to services like YouTube, Periscope, and Facebook, compared to the 720p video on the latest Phantom. The unit also adds a couple new tricks in its computer vision system. It still works for avoiding obstacles and tracking subjects, but now it also comes with gesture control. Fly the unit out in front of you and put down the remote. Wave your hands to get the drone’s attention. Throw your arms up in a big Y and it will focus on you. Make a frame in front of your face with your hands and it will start the timer for an aerial selfie. This system didn’t work during our hands-on demo, but DJI says it will be ready when the product ships. The drone isn’t the only thing that DJI shrunk down for this latest offering. The remote has also been miniaturized. It’s now roughly the size of a NES controller, with a small screen that provides basic telemetry: height, speed, distance, and orientation. You can fly with just that or clip your phone in to add the live camera view and advanced flight mode options. This is also the first DJI drone you can fly without a remote at all. There have been lots of drones on the market that offered this functionality, going all the way back to the original Parrot A.R. drone released at CES 2010. 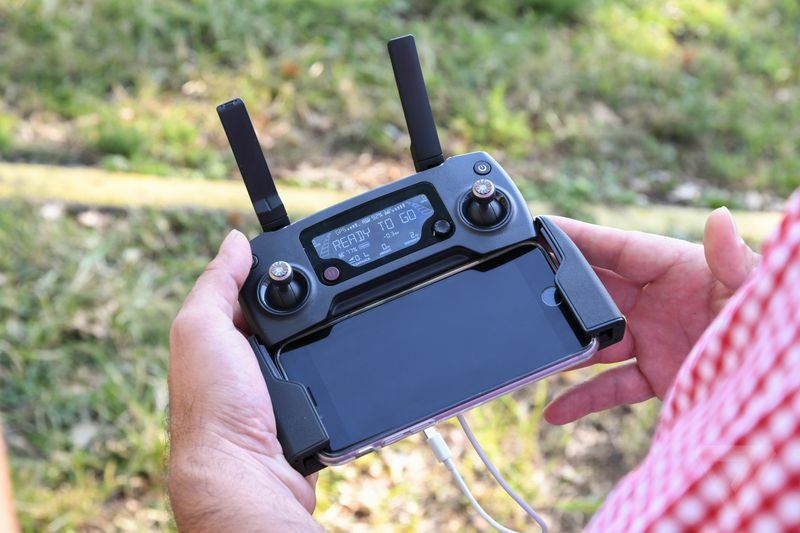 DJI has always stayed away from that approach, preferring the more reliable connection and precise flight that comes with a dedicated radio controller. But with all the computer vision technology onboard, DJI can now deliver a pretty robust experience without a remote. With the Mavic Pro, like the Phantom 4, you can now take off, fly, return to home, and land, all by simply tapping on the screen. In "tap-to-fly" mode the drone will always move forward, and will automatically sense and avoid obstacles. CAN DJI REACH NEW CONSUMERS AT A $749 PRICE POINT? Going app-only is DJI’s way of trying to reach more casual consumers, people who might feel intimidated by a two-stick controller with lots of buttons, but who find gaming on their smartphone a snap. Combined with its much smaller profile, the Mavic Pro is clearly an attempt to reach and audience of buyers who have long been curious about drones, but were put off by the idea of a big carrying case or complex flight controls. The one thing that isn’t more casual about this unit is the price. The Mavic Pro will retail for $999, well above the cost of small, smartphone-controlled units from Yuneec and Parrot. Of course, those drones don’t have nearly the precision, performance, or advanced features of the Mavic Pro. But if the point is to reach a new audience, one that didn’t buy a Phantom, packing all this firepower seems like it might be overkill. DJI is taking a half step in that direction, offering the Mavic Pro for $749 if you opt to buy it without the remote. That makes it cheaper than the new GoPro Karma, which retails for $800 if you buy it without the camera. If you took this same unit and made it with half the range, half the speed, and just the basic autonomous feature set, but priced it at $500, I could see it besting a whole category that have always competed on size and price, not performance. Frankly, most casual consumers don’t need 40 mile per hour speeds and a 4-mile range, or the risks that come with those capabilities. Toning things down to make a drone more accessible, however, isn’t part of company’s DNA. "DJI has spent a decade making it easier for anyone to fly, and by rethinking everything about how a drone looks, we have created an entirely new type of aerial platform for anyone to explore their creativity," said Frank Wang, DJI’s CEO and founder. "Mavic Pro is a technological triumph filled with features that once again show how DJI leads the industry." This last sentence is definitely true, the Mavic Pro extends DJI’s dominance over the rest of the market in terms of features and performance. But whether a drone this powerful and expensive will truly expand the audience for DJI’s products seems like the more important question.